The Logging Road Cyclist is one of those folks for whom a common occurrence is to get out of the house and down the road a ways when suddenly it occurs to him that he just might not have shut off the stove with the kettle on it. He then has to struggle do decide which is the stronger: 1) The honest fear that his house will burn down with his dogs inside, or 2) An unwillingness to give in and admit that he is in fact slightly neurotic. Generally the latter prevails, but, having once had a neighbor’s house burn to the ground quickly and spectacularly, it is often a real fight. Just the other day, TLRC put on the kettle to liven up an otherwise tense morning at the computer, retreated to his lair and promptly forgot about it. A whistling teakettle, it had always warned TLRC when it was ready, and for years it had done its job well. But lately, the top hadn’t been shutting all the way, and sometimes the whistle failed to whistle when the water boiled. So it did again, and the water all boiled away, and TLRC came out to a red-hot kettle whose plastic top was just shy of falling off onto the stove. For years both TLRC’s buddy Stump, and TLRC’s mother had advised him to get one of those auto shut off electric kettles. 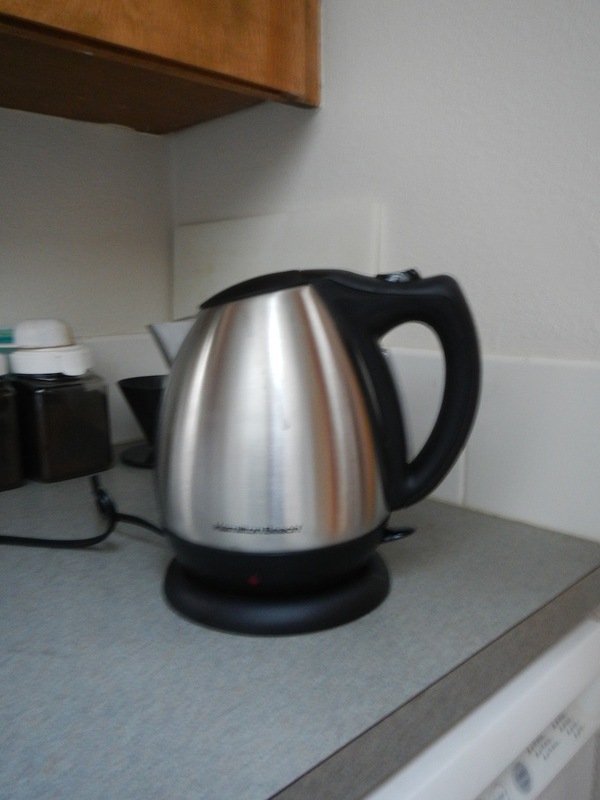 TLRC, not a fan of counter top appliances in general, had for years fought off getting a toaster (only to find how much he enjoyed toast), and likewise eschewed the electric kettle, until this last straw. Out went the faithful whistler, and TLRC hauled himself off to BiMart, where for less than a new whistler, he got a Hamilton Beach electric. What a treat! Fast safe hot water! Who would have known. Last weekend on Praire Mountain, the TLRC feet were getting cold, and as a tactic to keep himself from getting driven nuts by an incessant snick-snick-snick and a seat post that simply would not tighten, he pondered how he might keep them (the feet) warm without using foot-cramping heavy socks (not an option for a variety of podiatric reasons) or cumbersome neoprene overboots. “I wonder” he mused while listening to neither the snick-snick-snick, nor checking the seat post gradation once again, “if someone makes a light, windproof sock, maybe Goretex?”. A number of other options coursed through his brain against the backdrop of the noise and slippage that were on the verge of having him chew through the side of his cheek (more later). 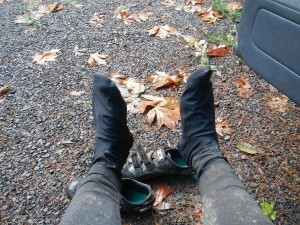 Well, as it turns out, there are Goretex socks, even ones specifically for cycling. TLRC got a pair and aired them out today. After a couple of hours of rain and muddy road, with a creek ford thrown in for good measure, the TLRC inner toe socks were dry enough to wear home and into the evening. How he managed to ride all those winters past without these babies is something TLRC cannot fathom.